Locate woodmart.zip file and sign into your WordPress Dashboard (e.g., ). Go to Appearance > Themes > Add New > Upload, and select the file, click “Install Now“. Once the theme is uploaded you will need to activate it in Appearance > Themes. Wait while the theme is uploading, install and activate it. 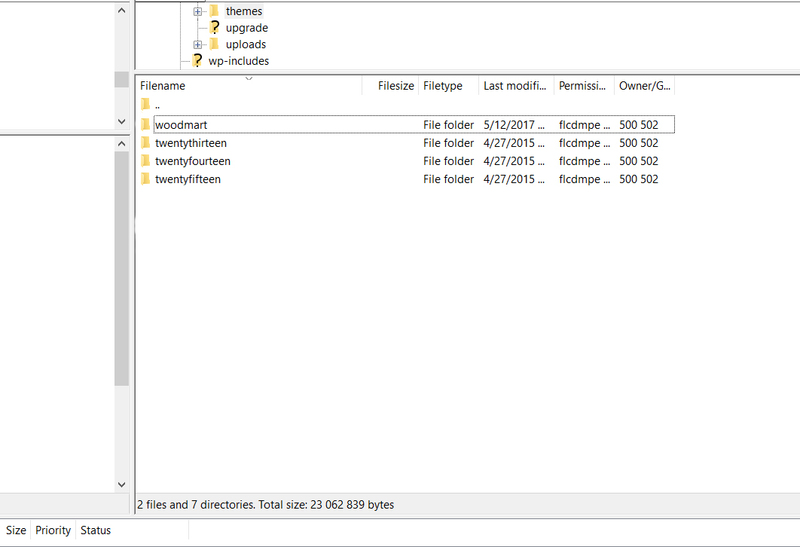 Make sure ZIP file contains folders and files of the theme, not the inner additional ZIP. Before start working with the theme, it is necessary to install required and recommended plugins that come with our theme package. Wait until all plugins will be installed, activate. As soon as the theme has been installed with the required plugins, the Dashboard gets Theme Settings and Woodmart tabs. The Theme Settings Tab provides all the options to configure the site as per the business needs. The theme can be activated twice with one and the same license key in order to ensure the possibility to develop a site on a staging platform and then transfer for the final domain. However it the theme is supposed to be used on different domains, it is necessary to acquire licenses for each domain separately. Note: installing demo content doesn't create a site that is an identical copy of our demo site because it has a big number of pages and images that takes to much time to complete. Watch our video tutorial that demonstrates how to install our theme and import dummy content properly just in a few minutes.